Like many from the San Joaquin Valley, I grew up rooting everything Fresno State with fond memories of Kevin Sweeney, Trent Dilfer, David and Derek Carr and, of course, the likes of Lorenzo Neal, Ryan Mathews, Henry Ellard, Rodney Wright II and Davante Adams to name a few among hundreds. Saturdays were sacred, reserved for Fresno State football, and oftentimes my mood for the remainder of the weekend was dependent on how the Bulldogs fared on the field. So, what happens when this lifelong Fresno State football fan becomes a sportswriter then morphs back to a screaming, rabid, frenzied fan? Well, let me tell ya – it was liberating and it was spectacular. I traded in my notepad and trusty pen and stood among thousands of Fresno State fans in a sea of red at Sam Boyd Stadium in Las Vegas, whooping and hollering and cheering our beloved Bulldogs in their impressive 31-20 victory over Arizona State at the Las Vegas Bowl. There’s no cheering from the press box is a common mantra for sportswriters, but not this time. I was free to roar and high-five fellow fans, and as Tank Kelly returned an interception for a touchdown and a 10-0 lead in the first quarter, I stood on the back of the bleacher seats in front of me, screaming like there was no tomorrow. Strangers hugged strangers, who then became kindred spirits. The game was a fitting end for a most impressive season for the Fresno State program under Jeff Tedford, perhaps the greatest in its storied history: A 12-2 record (most wins in school history) and winning back the Red Wave in the process, just two years removed from that 1-11 stinkfest under Tim DeRuyter that’s now fully in the rearview mirror. A remarkable turnaround to be sure, but what struck me most during the game – and as fans swarmed the field after the final whistle – was the sense of community, love and pride that permeated within Bulldog Nation. I certainly felt it. The celebration poured onto the field, where fans posed for pictures with players and coaches hugged their wives as blue and yellow confetti littered the turf. It was community at its finest. Even coach Tedford, usually hard-pressed to crack a simple smile, couldn’t hide his emotions, beaming from ear to ear, shaking hands with all that extended theirs. You see, the more we realize the importance of relationships, the more we cherish them. Tedford understands this to a T. Spend a few seconds with a Bulldog player, or media member, and they’ll tell you how much respect they have for Tedford, how they play hard for him and his staff because they know their best interests are in mind. Relationships and community certainly breed unity. And personally, there were five extra reasons to root for Fresno State in Clovis Unified products George Helmuth (Clovis North), Josh Hokit (Clovis), Ka’Lonn Milton (Buchanan), Kyle Riddering (Clovis North) and Jasad Haynes (Clovis North). In addition, I had a special connection with Marcus McMaryion, the senior quarterback from my hometown of Dinuba. I hugged his mom, Liz, who I attended school with through junior high. Both Helmuth and Hokit walked onto the team. 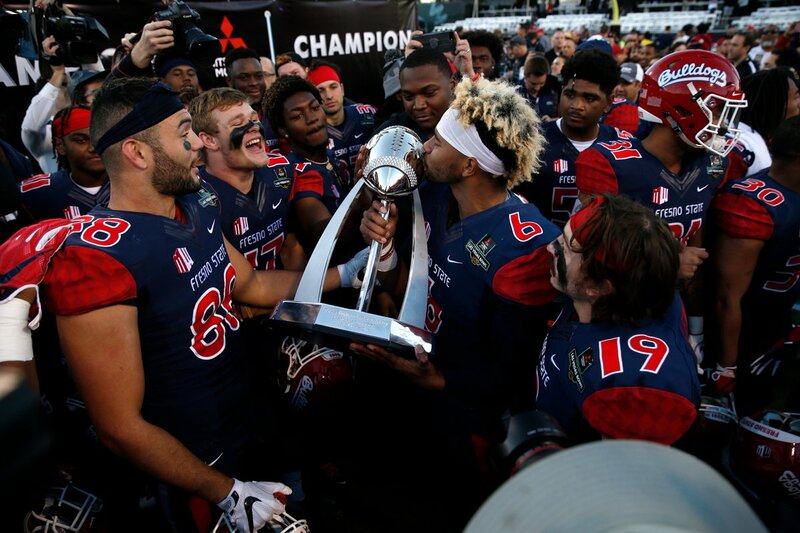 After grinding through that 1-11 season, they were crowned 2018 Mountain West Conference champs and winners of two bowl games, including the 2017 Hawaii Bowl. Their journey was justly rewarded with the Las Vegas Bowl as a proverbial cherry on top. While the party on the field was raging on, there was Helmuth being interviewed on live television with his grandpa by his side. Helmuth epitomized this year’s Fresno State team – tough, gritty, and extremely likable – and the senior certainly understands the power of community is vitally connected to something greater than yourself. He felt it, and during this sweet Las Vegas bowl victory, so did I.